In the matched-pairs data, McNemar's test (McNemar, 1947) can be applied only to the case in which there are two possible categories for the outcome. In practice, however, it is possible that the outcomes are classified into multiple categories. 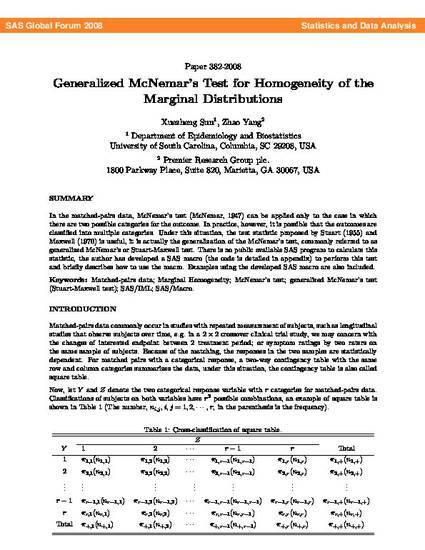 Under this situation, the test statistic proposed by Stuart (1955) and Maxwell (1970) is useful; it is actually the generalization of the McNemar's test, commonly referred to as generalized McNemar's or Stuart-Maxwell test. There is no public available SAS program to calculate this statistic, the author has developed a SAS macro (the code is detailed in appendix) to perform this test and briefly describes how to use the macro. Examples using the developed SAS macro are also included.